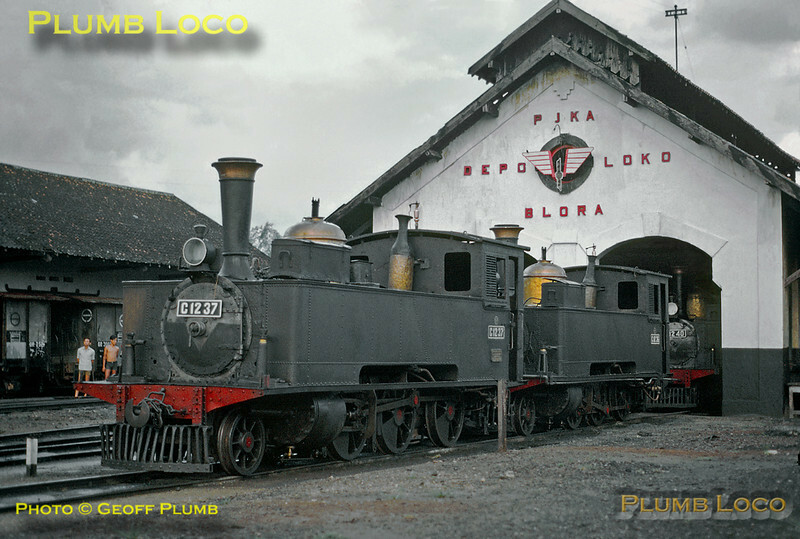 The imposing loco shed at Blora is well up to date at the time, having modified its ownership from PNKA to the newly changed PJKA. This was a three way junction in north-eastern Central Java, with lines running north west to Rembang, south east to Tjepu and south west to Wirosari, all of them fairly minor lines. Three members of the two-cylinder compound 2-6-0Ts of class C12 grace the shed, all nicely kept with polished brass, though how often they moved is uncertain! All three locos, C12 37, C12 36 and C12 40 are from the same batch of seven built by Hartmann in 1902, works numbers 2733, 2732 and 2736 respectively. This was the last batch of the forty three locos built, all by Hartmann from 1893 to 1902. Sunday 22nd July 1973. Slide No. 11654.